As a bridge between Asia and Europe, at the crossroad of civilizations, Turkey has excelled in establishing itself as a mainstream destination for many European nations because of its rich culture, history and natural beauty. The direct contribution of the travel and tourism industry to the GDP was USD 27 billion and the total number of As a bridge between Asia and Europe, at the crossroad of civilizations, Turkey has excelled in establishing itself as a mainstream destination for many European nations because of its rich culture, history and natural beauty. The direct contribution of Turkey’s Travel and Tourism Industry to Turkey’s GDP was 27 billion USD and the total number of international visitors was more than 31.5 million. The Turkish Tourism Industry has grown more than the Global Travel and Tourism Industry. There are 75 different Hotels working on a combined 11,376 rooms and global brands (such as Hilton, Fairmont, Starwood, Wyndham, Carlson Rezidor, Marriot, IHG, Accor and Morgans) are among the leading operators expanding in various segments and regions in Turkey`s Hospitality Market. 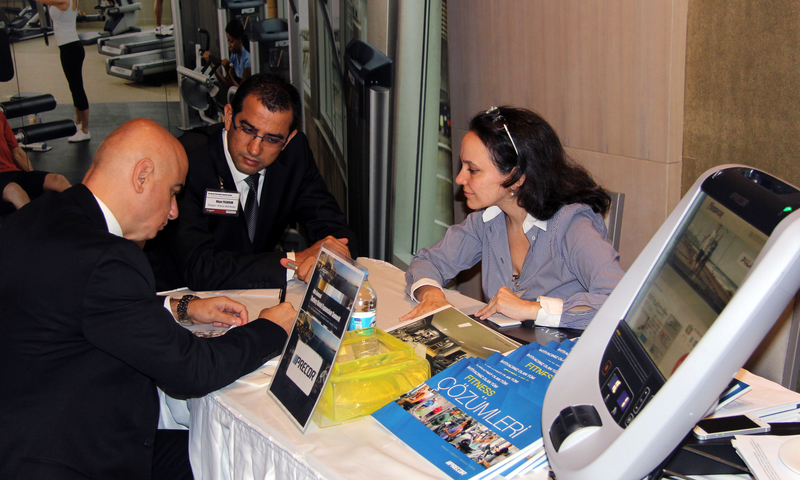 Noppen`s 4th Annual Turkey Hotel Expansion Summit featured the most prominent industry leaders providing informative and inspiring discussions pertaining to the region's current needs and ambitious future. Global and local leading operators, developers, investors, construction companies, architects, financial institutes, associations, consultants, and solution providers discussed projects, future investment possibilities, international stakeholder involvements, design trends, and technology updates. The Summit was opened by Mr. Haluk Özdoğan, the summit’s Chairman, who is the Chairman for Access Hospitality Development & Consulting. He started his opening speech by welcoming the participants, briefly outlining the two days conference program and wishing everybody a fruitful event. His introduction was followed by Mr. Hüseyin Özdilek, the Chairman of Özdilek Holding, who welcomed the participants as the host of the event, expressing his happiness to see such elite members of the society gathered in Wyndham Grand to contribute to the development on the industry by sharing insight and experience. He also expressed his commitment to the industry as an investor and wished others success in their future investments. Mrs. Özlem Kasa, the editor of Tourism and Investment Magazine, was next on the stage with a hotel investment market outlook based on Tourism and Investment Magazine’s latest research data. She provided answers to the questions like: How is market demand and supply shaping up? Analysis on the existing hotel stock in the region. Which segments received the investments and where are the gaps in the market? Her presentation laid a foundation to the event revealing crucial statistics for the investors, operators, developers as well as service and equipment providers. Mr. Metin Erdoğdu, President of Horwath HTL – Turkey was the next speaker addressing the investors, informing them about The truths and key facts for go/no-go decisions in hotel investments in Turkey. He summarized advised on 10 crucial stepping-stones which were quoted throughout the event on both days. First panel of the event was chaired by Ms. Çiğdem Türkyılmaz Kubak the CEO of Servus International, and she revealed the opportunities & speedbumps ahead with her panelists: Mr. Murat Yılmaz, Senior Director, Acquisition & Development, EMEA at Starwood Hotels & Resorts Worldwide, Ms. Serra Arıkök, Head of Hospitality Investments at Demsa Group, Ms. Frida Hansen, Director of Business Development at Steigenberger Hotels AG, and Mr. Tuğrul Temel, Development Director of Hilton Worldwide, they analyzed the real-time issues confronting the industry, the challenges restricting the opportunities in the region, investor`s & operator`s feedback on the recent developments and their possible impacts for the future. 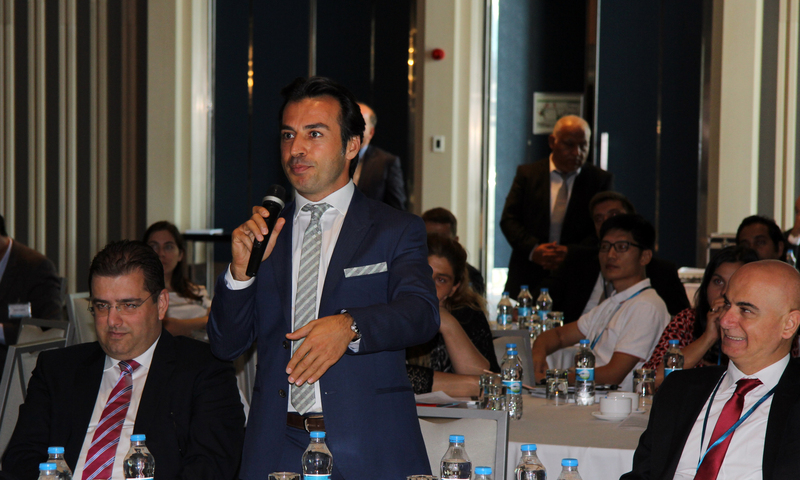 They also commented on the competitive advantages of investing in Turkey`s hospitality market, how the future will differ by size, scale, and the positioning & marketing of the hospitality product. 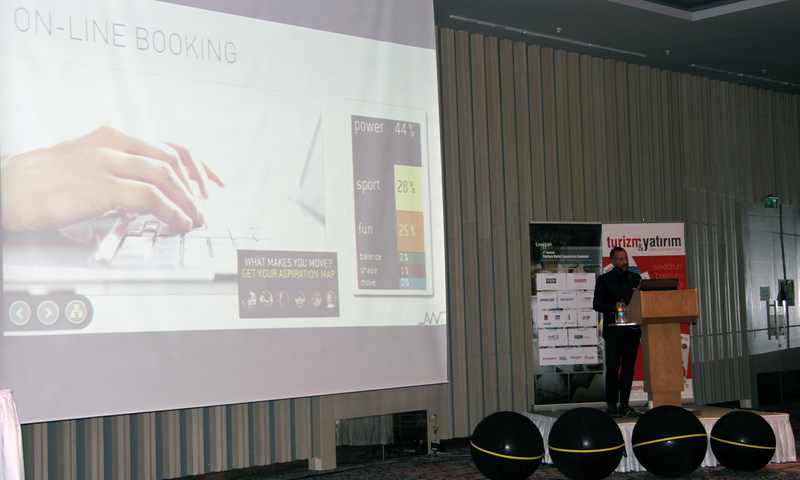 After the first networking break Mr.Vittorio Zagaia, President of AVV Ltd - Technogym The Wellness Company introduced Technogym’s solutions for the hospitality where business models like A`la Carte Gym, seamless fitness experience via software solutions and usage of plates ball replacing chairs in the guest rooms were followed by the participants with great interest. Mrs. Makbule Yönel Maya, General Manager of TSKB Real Estate Appraisal Company was the chairperson of the second panel where she was in conversation with Mr. İlhan Köse, Director of Operations & Support Turkey, Central & Eastern Europe EMEAI of Wyndham Hotel Group, Mr. Yalın Yaltıraklı, Development Director, Turkey & CIS at InterContinental Hotels Group, Mr. Volkan Öngel, Managing Partner of Akgel Real Estate Investments, Mr. Murat Duran, Managing Partner of N+1 Daruma and Mr. Onur Kurç, Developer at Accor. She checked the appetite of investors, operators, and creditors for the future development of the hospitality market digging for insight from existing and new players. She directed her questions to find out: How does the environment differ and how will these new considerations shape the pipeline in the region? Which hotel segments and cities are high on the radar? How difficult is it to secure the finance? What are the alternative development & financing models available? Following the lunch break Mr. Chris Nader, Vice President Development at Shaza Hotels was on the stage to introduce a new brand for the newly developing segment in the Turkish hospitality market. He provided interesting statistics and market value of halal tourism which created a lot of attention in the room. He then pointed out how lucrative and hungry the current market is for an internationally branded luxury concept like Shaza Hotels. His presentation was followed by a discussion panel chaired by Mr. Metin Erdoğdu, President of Horwath HTL, Turkey and whose guests were Mr. Ekrem İmamoğlu, Mayor of Beylikdüzü and Mr. Aykurt Nuhoğlu, Mayor of Kadıköy of Istanbul. He explored the local municipalities' roles and support for hotel investments. What kind of assistance and incentives are available for the investors? This lively panel received attention from the floor where investors enquired further developments possibilities of their brands in the region. Before the last networking break Mr. William Wang, Country Manager of Turkey at Hikvision took the microphone introducing security solutions for the professionals of the industry. 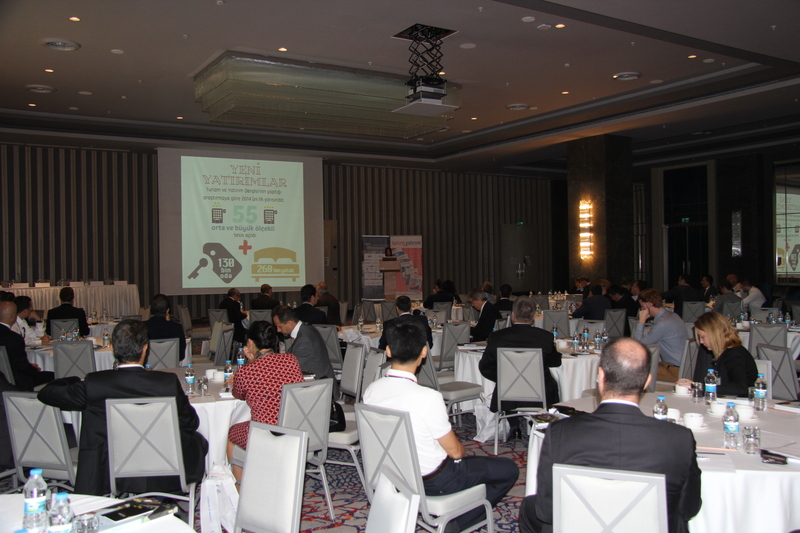 His presentation was followed by two speakers from Orco International, Mr. Christian Facile, Partner, Hospitality Services, and Mr.Tevfik Örten, Managing Partner revealed the great profit potential in branded serviced hotel apartments. Their presentation was an eye opener after a coffee break where their very detailed presentation shared: the ideal SA investment in Turkey, SA in mix use developments, Global SA trends & current SA market in Turkey, barriers and conditions in Turkey slowing down SA development and finally financial information’s and exit scenarios for developers. The momentum kept growing with the last discussion panel of the day which was moderated by the chairman of the summit Mr. Haluk Özdoğan; his guests were distinguished members from the industry, such as Mr. Ferzan Çelikkanat, General Manager of Er Investment & Development, Mr. Yusuf Arslan, Vice Chairman, Real Estate Developments at Mar Yapı, Mr. Romain Avril, Vice President Business Development at The Rezidor Hotel Group and Mr. Tarık Nasser, Vice President Development – Turkey at Marriott International. They together explored various issues about management agreements, franchise and manchise. They reviewed the core issues, discussing the pros & cons of each model, what factors should be considered when selecting a hotel’s brand and operator? How to negotiate right management contracts, key issues and why they matter from both sides of the negotiation. 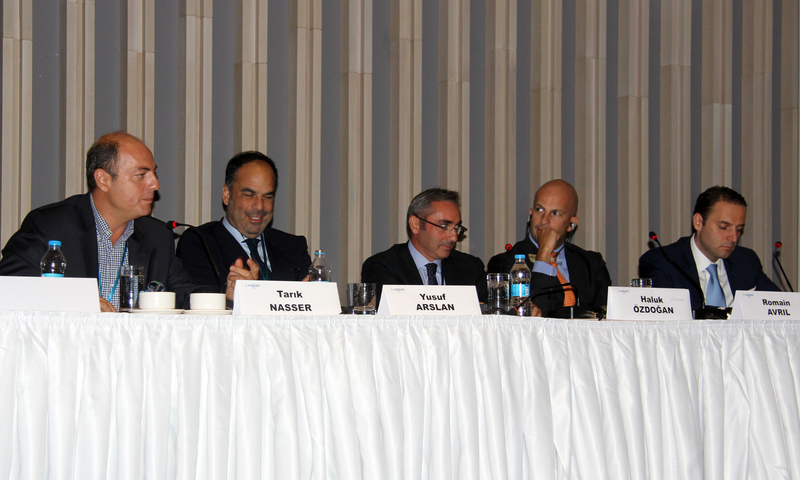 What does `manchise` means for the Turkey Hotel Market Development. Thanks to executive participants, the panel was very insightful, extraordinary and enjoyable. It was almost 6pm when the Chairman closed the event with very short remarks preparing the participants to the second day of the summit. Friday morning started with the chairman`s remarks of the first day and introduction of Mr. Roland Paar, Vice President Development Europe & Middle East at Capella Hotel Group shared insight on successful operating models in the ultra-luxury market trying to help participants in choosing the right business mix for their key assets. A concept based on performance excellence and crafted luxury design was introduced. His presentation was followed by Emaar Square mixed use development video which created a foundation to the next discussion panel focusing on the evolution of the investment & business model chaired by Mr. Sedat Nemli, Chief Operating Officer, Hospitality at Servotel Corporation in conversation with Mr. Bilge Turcan, Chief Business Development Officer at Dedeman Hotels & Resorts International, Ms. Badegül Albayraktar, Deputy General Manager at Emaar Properties, Mr. Mehmet Ersül, Real Estate Development Manager at Ege Yapı Group and Mr. Roland Paar, Vice President Development Europe & Middle East at Capella Hotel Group. Speakers discussed relevant business models: what can be done differently? Is adapting the existing commercial and residential buildings for hotel uses still a preferred option? What about integrating & managing hotel properties within mixed-use developments? What are the synergies and benefits of combining hotels with other real estate uses. Panelists also discussed what hotel segments, markets and development types are successful in existing assets & in emerging mixed-use environments from investor`s and operator`s point of view. 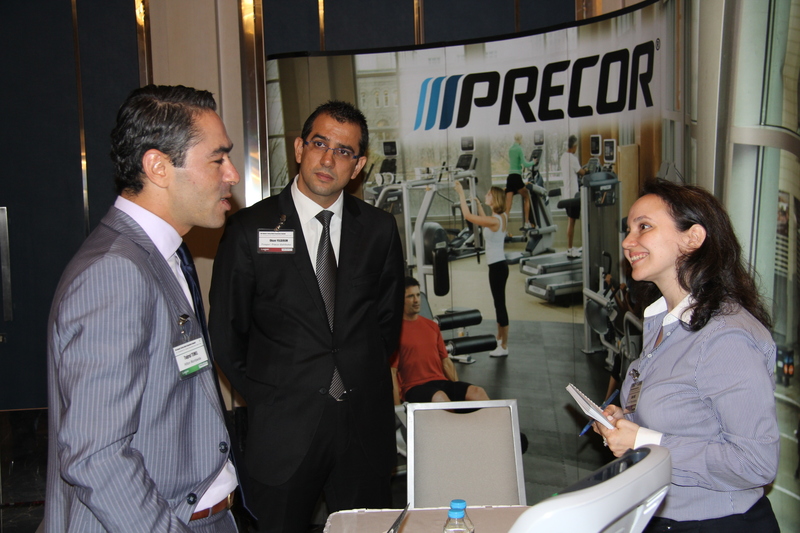 Following the first networking break of the day Mr. Engin Kabakçı, General Manager Engineering & Consulting at TSP Facility Management presented facilities management meeting hospitality. He gave solid information on how facility management can reduce construction and operation cost while extending the life and value of the asset while giving the operators more time to spend on their guest`s satisfaction. 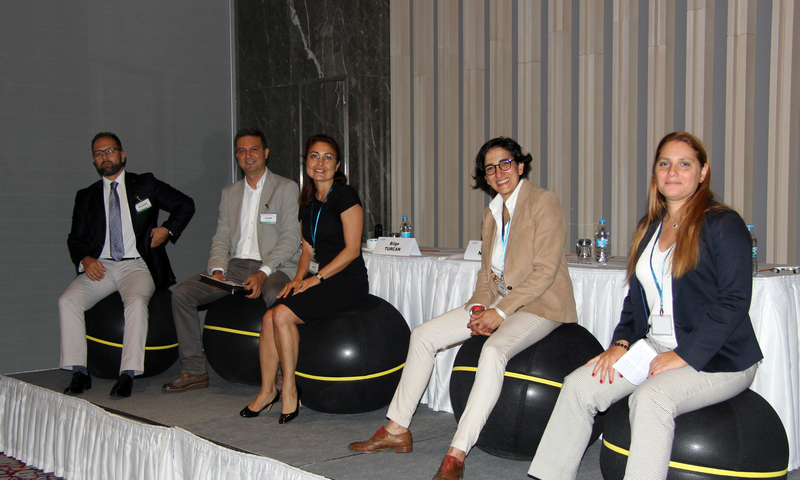 The panel designing for profit and customer experience started with an innovative way where panelist decided to sit on the wellness balls of AVV – Technogym on the podium instead of traditional chairs. 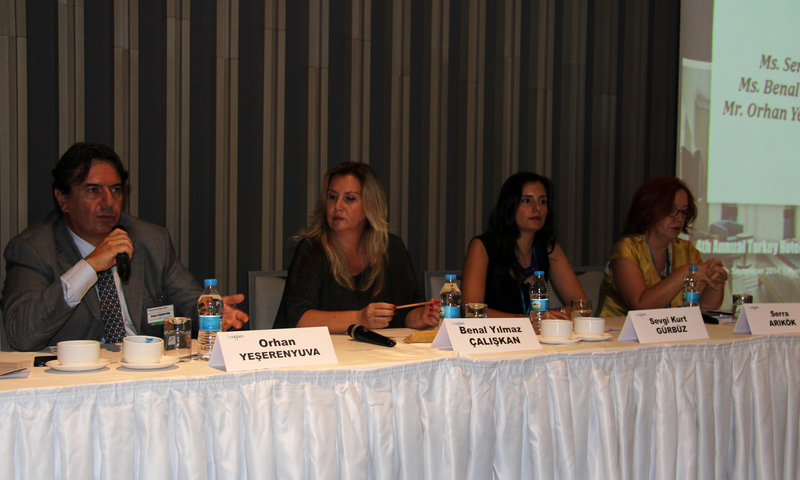 Panel was chaired by Ms. Defne Gezen, Managing Director of DTM Hospitality Consulting where her guests: Mr. Hakan Özkaşıkçı, Design Manager, Turkey & SE Europe at InterContinental Hotels Group, Ms. Aslı Kutlucan, Partner of Cycas Hospitality, Ms. Sayeli Uysal Ayaydın, Director of Hirsch Bedner Associates in Turkey and Mr. Cavit Arıkan, Project Manager of Accor analyzed and questioned the latest design trends addressing the needs and wants of the hotel guests in the emerging segments. Strategies for reaching and monetizing a new generation of customers: What design elements or new room offerings are likely to add value for Millenials, Generations X and Y, and the Baby Boomers? Who are they and what do they want? What are they willing to pay more for? The panel was a great success. Following the lunch break Ms. Sevgi Kurt Gürbüz, Consultant - FFE & OSE Procurement at BDO Hospitality Consulting chaired the next panel on operational excellence where panelist were Ms. Serra Arıkök, Head of Hospitality Investments at Demsa Group, Mr. Orhan Yeşerenyuva, Managing Director of Progress Hotel Management & Consultancy and Ms. Benal Yılmaz Çalışkan, Ex-Director of Nef Bebeköy / Viceroy Istanbul. They have discussed in detail benefits of outsourcing procurement. 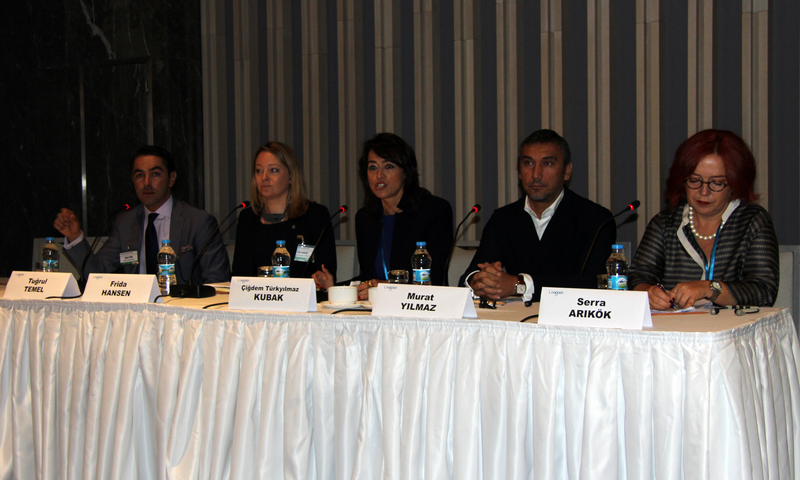 Following Ms. Gürbüz`s short presentation panelists shared insights on which items cost more in FFE? Do you sometimes need foreign suppliers in refurbishment? What about local market capability. One of the most interactive panels of the event was searching for the answer to How disruptive is Airbnb? Are they a real, long-term threat? Advantages/disadvantages of the marketplace was chaired by Mr. Mete Varas, Vice President – Europe at REIDIN in conversation with Ms. Ayşe Yağcı, Founder & CEO of Jules Verne Travel & Event Company and Mr. Frank Reichenbach, General Manager & Regional Manager, Turkey of Mövenpick Hotels & Resorts. Although, the panel was quite controversial and generated a lot of questions from the audience, the consensus was clear that the new mindset is here to stay and stakeholders should incorporate the new trends into their plans. The last session of the summit was dedicated to eco-friendly buildings in the hospitality industry; the Chairperson of the panel was Dr. Duygu Erten, President from the Turkish Green Building Council. Her guests Mr. Gökhan Avcıoğlu, Principal & Founder of GAD - Global Architectural Development, Mr. Erdem Şatıroğlu, Project Manager of GEMDSE Project Management LLC and Mr. Mehmet Sami Kılıç, Business Development Manager of Turner International shared their insights on the tangible and intangible benefits of investing & operating Green Hotels, how these factors should be evaluated and used in the decision-making process. They all agreed that green hospitality is not anymore a niche but already a mainstream product and is worth spending every penny. Event was concluded with the closing remarks from the chairman, thanking to speakers, participants, Noppen and sponsors: AVV Ltd – Technogym, Hikvision, SKIDATA, TSP Facility Management, Precor, EEC, HUB Parking, TeleAdapt, Titan, Hakman and IDS Next for their contributions to the success of the event.